Drone/Airplane/Helicopter Aerial & Architectural Photography We are a professional aerial & architectural photography service and look forward to discussing your imaging needs 7 days a week. Because every project has varying requirements, size, location and imaging needs, please use our Site Locator to pinpoint and describe your site or call or e-mail us with your site details. Chris Wawro is a Commercial/Instrument SEL airplane pilot and has amassed over 21 years of safe flying. Chris is also an FAA certified Remote Pilot - sUAS. The company's Cessna 172M Skyhawk II and DJI Inspire 1 Pro X5 drone are impeccably maintained and insured for commercial aerial photography. 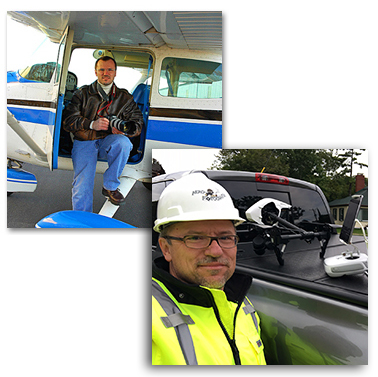 Prior to entering full time into the commercial aerial photography arena Chris spent 26 years as a journeyman Tool & Die/Mold maker and also maintains ToolWorks, a machine shop interest he had started in 1992 as a side business. Chris feels it is vitally important to keep alive the knowledge of being able to take ideas and turn them into physical reality. During his employ in the Tool & Die/Mold trade Chris was highly respected for his meticulous attention to precision and detail, that which he carries forward into everything he does. Our clients hire us in confidence knowing that a high level of professionalism is at work for them. It's all about commitment to excellence in service and importance of building a strong, lasting relationship.